Osaka’s ‘Star Wars’ train came as a real surprise to me. It’s not the sort of thing you’d expect when travelling Japan’s rail network, and if you’re quick, you might be able to catch it too. It’s running on the Kansai International to Osaka Namba Nankai line until May 2016 to tie in with the long awaited blockbuster movie Star Wars: The Force Awakens. And if you’re not able to make it to see the Star Wars train in person, you’re still going to love the photos: make sure you share this with any other Star Wars nuts out there. 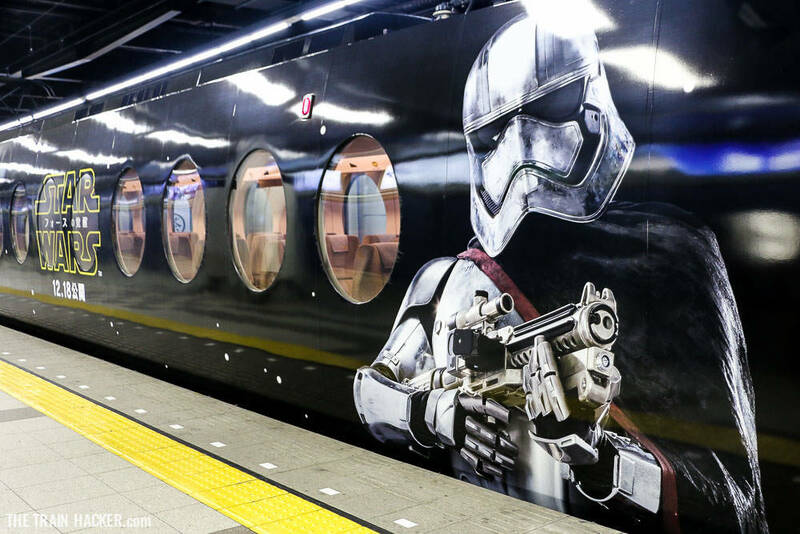 The Star Wars train’s striking, retro-futuristic design and attention to detail is truly memorable – only in Japan! The train links Namba (Osaka), to Kansai International Airport and goes by the full name of the Star Wars: The Force Awakens Nankai Limited Express Rapi:t Train. As you might expect, the Star Wars train features the main characters from the Force Awakens on its external livery and interior design. Anyone touching down at Kansai Airport will wonder if they’ve arrived on the same planet when they see the space age train. It’s already got Japanese Star Wars fans flocking to ride the train and admire it from the platform. The Star Wars train is a collaboration between the movie, Kansai International Airport and Nankai Electric Railway. It’s designed to promote Osaka to a domestic audience, plus worldwide as a gateway to Japan rivaling Tokyo. If organisers were hoping for a big impact, then they’ve achieved their aim, with loads of coverage nationally and internationally already. It’s not hard to see why. For starters, the Nankai 50000 Series train that serves the line bears a striking resemblance to Star Wars baddie Darth Vader, so much so that the engine was known as the ‘Darth Vader Train’ long before this project kicked off. The train’s striking jet-black livery makes an immediate impact. The distinctive helmet-like driver’s cabin and sleek, jet black straight edges give it a unique space age look. Each of its six carriages features characters from the Force Awakens film and the classic Star Wars logo. If you’re still in doubt if you’re in a galaxy far away, stepping inside the train will do the trick. Even without its Star Wars makeover, the Nankai 50000 interior is high tech and super space age. Large round windows are reminiscent of portholes from the flying saucers of classic sci fi movies. It’s like nothing you’ll have ever seen on another train. The most impressive detail for me was the carriage lighting. Incredible detail creates a remarkable fusion of Art Deco and sci-fi style. It would be impossible to travel on any train, anywhere else, that feels more like you’re in a spaceship. The Star Wars theme is most prominent in the corridors that separate the carriages. Like the exterior, different movie characters feature in each section. The Star Wars characters stand out dramatically against a galactic backdrop of space and stars. The space age style continues into the seating compartments. The original Nankai 50000 provides the perfect base for the Star Wars design. The doors, stretched oval windows, and smooth opening mechanism reinforces the whole sci-fi feel. Carriage 06 provides a neat twist from the rest of theme with a 3D model of an R2D2 next to an image of the Force Awaken’s foremost baddie Kylo Ren. The Star Wars train operates on the Kansai International Airport to Namba (Osaka), Nankai Limited Express Rapi:t service. It’s not going to be running forever, though, operating up to Sunday 8 May 2016. It runs up to eight times daily in each direction. Total journey time from Kansai International Airport to Namba (Osaka) is 38 minutes. Timetables change every month but on most days it runs between seven and eight times between the hours of 07:00 and 21:00. Train times do vary slightly every day so if you’re lucky enough to be in Japan while the Star Wars train is running it’s best to check the Nankai ‘How to Enjoy Osaka’ website. Tickets are available online and you can pay with Visa or Mastercard. Online discounts are available between Kansai International Airport and Tengachaya, Shin-Imamiya or Namba (Osaka). For ticket purchases, see the Nankai ‘How to Enjoy Osaka’ website. Most people visiting Japan buy a JR train pass, but unfortunately, it’s not valid on the Star Wars train. But at less than $10 one way, and with further discounts on return journeys, the trip is more than worth it. If you’re already in Osaka, you can see the Star Wars train at Nankai Osaka Namba railway station. Get a close-up look 30 minutes before the train departs. You’ll need to check the train departure times as they change every day. When you arrive at Nankai Osaka Namba go to platform nine. If you’re on time you’ll see the jet-black Star Wars train straight away. To get onto the platform buy a pass from the ticket booth by barriers at platform nine. Any travellers arriving at Kansai International Airport should definitely take the Star Wars train. And if you’re heading to Namba or central Osaka, it’s well worth the extra waiting time. For Star Wars fans lucky enough to be in Japan it’s well worth making the detour to see and ride on the Star Wars train – you won’t be disappointed.